Bunions are due primarily to genetic factors but can become painful over time due to trauma, ill-fitting shoes and poor foot structure. Grand Central Foot Care can provide diagnosis and treatment options. Schedule an appointment today. Hammertoe is a deformity of the second, third, fourth or fifth toes. In this condition, the toe is bent at the middle joint, resembling a hammer. Left untreated, hammertoes can become inflexible and require surgery.People with hammertoe may have corns or calluses on the top of the middle joint of the toe or on the tip of the toe. They may also feel pain in their toes or feet and have difficulty finding comfortable shoes. Causes of hammertoe include improperly fitting shoes and muscle imbalance. Treatment for the condition typically involves shoes with soft, roomy toe boxes and toe exercises to stretch and strengthen the muscles. Commercially available straps, cushions or non-medicated corn pads may also relieve symptoms. 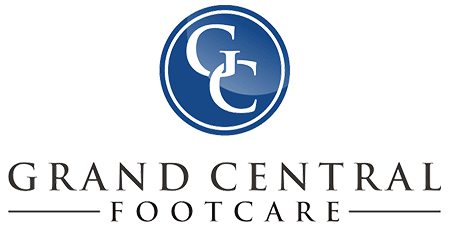 Schedule an appointment today with Grand Central Foot Care, we can help you find relief from hammertoes.